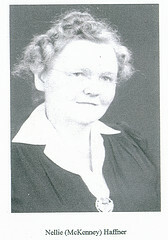 The poem, “Nellie”, was written by Doris Julia McKenney, daughter of George Ellis (Bob) McKenney, upon the death of her sister, Nellie. Nellie was a poet. Several of her poems can be found on this website under the tag “poetry by Nellie Adelaide Mckenney”. Doris was born January 5 1908 in Genoa, Minnesota. She married Lester W. Mattson, January 1, 1926 in Rochester, Minnesota, and died Sept 18, 1981 in Eugene, Oregon. Hear the lark at dawn…. You’ll know that I am near. My happy voice you’ll hear. As I go to meet the dawn.